+ What is a green wall or living wall? + What is the difference between types of green wall systems? 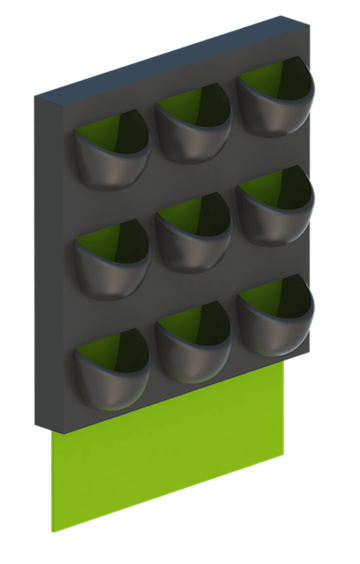 There are many different green wall systems on the market, but most of the systems can be categorized as either tray, module or one-piece systems. See more in our blog post [Living Walls 101]. These different systems can make a difference in weight, the amount of water required and maintenance required, whether or not waterproofing or wall reinforcement is needed for installation, etc. + What are the benefits of having a green wall? LivePanel is our patented modular green wall system, designed to be sustainable and simple. It is quick to install and effortless to maintain. + Where can I put a Suite Plants green wall? Our green walls can be installed on almost any type of wall, both indoors and outdoors, as long as there is enough light for the plants. + Can LivePanel be customized to fit any size wall? Yes, our LivePanel plant cassette modules are designed so that they can be cut into smaller pieces to achieve incremental sizes. LivePanel can be made to fit almost any size wall, both indoors and outdoors. + Can you add LivePanel to an existing space (retrofit)? Yes, it can be added to existing spaces without any need for waterproofing or wall reinforcement/blocking. + What are the other advantages of Suite Plant’s LivePanel Green Wall System? + What are Plant Cassettes? 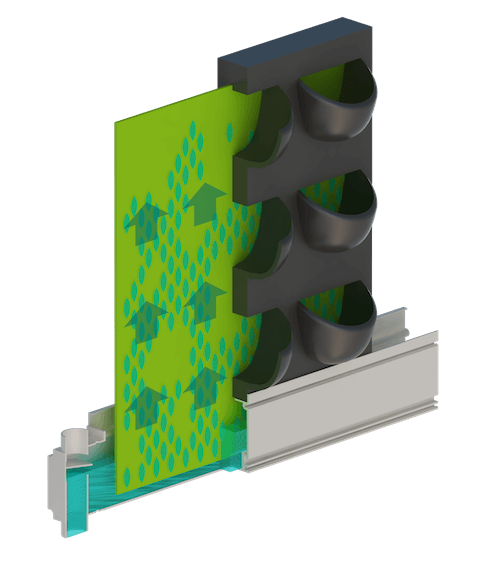 Suite Plants’ Plant Cassettes are the key component of our green wall system. These modular units, where the plants are housed, strike the right balance between ease of maintenance and robust plant health. The cassettes can be replaced, moved, or changed easily and independently. Plant Cassettes can accommodate any plant with a 4” base. The design fosters healthy plants by allowing plants to grow upright instead of horizontally and provides room for the roots to grow. + Are there LivePanel CSI Specifications, Engineering documents, CAD or Revit files? Yes, you can find all of our supporting documentation here. + Is LivePanel susceptible to mold or bugs? Mold and bugs thrive in areas where air, soil and water meet. Wet soil or standing water exposed to the air is the problem. The system uses a wicking system to keep the water, soil and air separate. The system does not have any wet soil or standing water exposed to the air, ever. Additionally, to prevent stale air and mold, a small air gap is naturally incorporated into the system so that air can circulate around and behind the cassettes. + How are LivePanel green walls irrigated (watered)? Larger walls are installed with our Irrigation Control Unit (“ICU”) which is connected to the building’s plumbing system and automatically waters the wall. + What is an Irrigation Control Unit? + What is the fully installed price per square foot? LivePanel starts at about $125 per square foot fully installed, but the price can go up from there depending on project size, site specific details, plant selection and geography. + What is the lead time on a Suite Plants green wall project? We can usually deliver LivePanel materials within 2-3 weeks, but we recommend pre-growing the plant cassettes for 6-10 weeks before installation to have a more “full” look on day 1. + Why choose to work with Suite Plants? Suite Plants offers a turnkey solution living green wall projects. Our team is extremely well-informed on all aspects of living green walls and has experience working with developers, architects, general contractors and plant maintenance companies to ensure your green wall is beautiful, long-lasting, and hassle free. We regularly provide advice to all parties involved in the green wall planning, design, construction, and maintenance process to evaluate the pros and cons of different green wall systems for each specific project. If our system is not well suited for a project we will tell you. We pride ourselves on being honest and objective. We have a proven, well-engineered green wall system and a partner network of reliable plant maintenance companies across North America. + How difficult is it to install LivePanel? Under normal situations, the system is very easy to install. The system is modular so it’s just a matter of learning the steps for each part and then repeating the same process. Projects involving curves, recessed areas and cutouts for windows or TVs can be slightly more complicated. + What's the weight per square foot and is reinforcement required? The system weighs roughly 8.2 lb./sf when fully loaded with plants and water. It can be installed directly on drywall without any requirement for reinforcement or blocking. + Does LivePanel require any waterproofing or moisture protection? For walls featuring automatic irrigation- we require a drain merely as a fail safe – in the worst case scenario where the water is running continuously, all excess water would simply flow down the drain pipe, but never on to the underlying wall. It is impossible for LivePanel to overflow as long as a drain is present. + What are the lighting requirements for indoor Green Walls? In general, most indoor spaces do not have an adequate amount of light (125+ foot candles) directed at the wall to foster healthy plant growth. Light readings must be taken in advance to determine how much light is present in a space. + What are the lighting requirements for outdoor Green Walls? Outdoor Walls: Generally, only naturally available light is used for outdoor walls since the sun is much stronger than any available light fixture. Lighting for outdoor walls is greatly impacted by the direction the wall faces and the region where the wall is being installed. + Who can install the LivePanel Green Wall System? LivePanel can be installed by the project general contractor, a sub-contractor, the plant maintenance company or a Suite Plants sub-contractor. Installation is not difficult and choosing the installer is a project-specific choice. Sometimes the installation can be split up by two parties with a general contractor installing only the hardgoods and a plant maintenance company installing the plants. + What types of plants can be used (indoor & outdoor)? For indoor installations, the plant pallet usually consists of various types of two light tropical plants. The main concern with indoor installations is ensuring that there is sufficient lighting for the plants. Please see our indoor plant guide for recommendations. For outdoor installations, the plant choices will be highly dependent on the climate of the location. The main concerns for outdoor installations are sunlight duration and excessive cold temperatures. + What type of plant designs can be made? There are many different possibilities for plant design and planting pattern. The size of the wall is the greatest determinant for plant design options (more plants = more possibilities), along with the client’s aesthetic preferences and which plants will do well in that specific environment. + What kind of maintenance do the plants need? All living walls need plant maintenance. The plants will need regular care, including pruning, fertilizing and treating illnesses. + How long do the plants last or do they ever need to be replaced? Even under ideal conditions, a small percentage of plants will die annually of natural causes. With a living wall you should generally expect to replace 1% - 5% of the plants per year and have plants last on average 4-6 years. + Can you grow herbs or vegetables? Yes, you can grow herbs and vegetables, but LivePanel is not the right system for this goal. Aesthetically, herbs and vegetables are not appealing in any living green wall system. + Do the plants need any fertilization? We recommend a low level of water soluble fertilizer to be added to the water supply to help the plants achieve maximum growth potential. Our Irrigation Control Unit contains a built-in water soluble fertilizer injector. + Does the LivePanel system itself require any maintenance? No, the system components are durable and do not require any maintenance. If installed with an Irrigation Control Unit that has a fertilizer injector then the fertilizer tank will need to be periodically refilled. + How much water does the system use? This is highly dependent on location (indoor or outdoor), the amount of lighting, the climate and the types of plants. + Can the plants use recycled rainwater? Yes, it is possible, but designing a rainwater recapture and filtration system is costly. + Who maintains LivePanel Green Walls? Suite Plants has a trusted network of over 300 interiorscaper partners across the country and can provide referrals for green wall maintenance.